A successful web presence that attracts your ideal client and makes a great first impression is now much more complex, incorporating not only your website and blog, but also your social media profiles, business directories and review sites. It’s no longer enough to just have a website. Your website is just one component of a complex network of information about your business that projects your brand and expertise to those in search of a product or solution. The opportunity to develop an solid web presence as part of your online marketing is immense. A well thought-out plan can help you gain visibility, develop an expert reputation and create a large digital footprint that attracts attention of your ideal prospects. There are many steps and tactics to make your web presence effective that will be different depending on your business model. 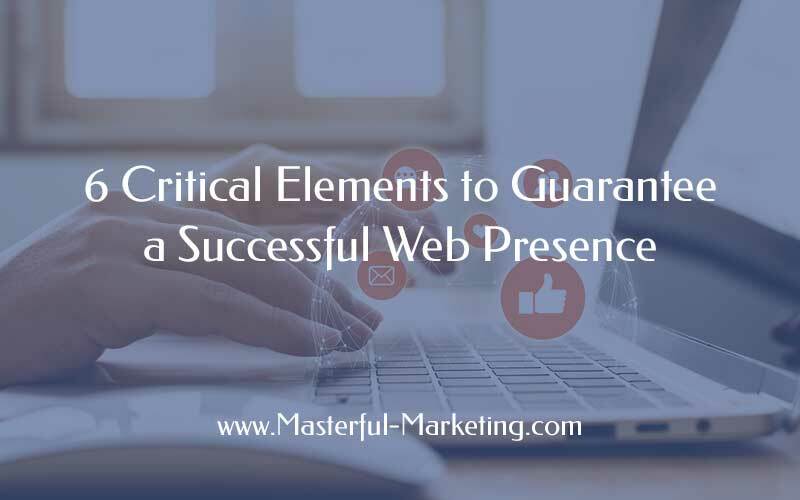 But regardless of your tactics, there are six overarching elements that are required for successfully creating a powerful web presence. Figure out your goals for this effort. 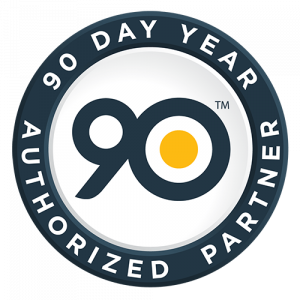 Are you looking to increase visibility, obtain an expert reputation or drive inbound leads? Knowing what you are trying to achieve heads you towards the right activities and eliminates wasting time on exercises that won’t get you where you want to go. Understand all the places that your business listing can be found and determine which ones are worth the time to claim. Do a search for your business name and catalog the various directories where it is listed. Compiling this list helps you understand the overall effort it will take to pull it all together and help you plan your time and resources. Is every place I can find a reference to your company consistent in what it says and how it looks? Think about how many businesses that have a similar name to yours. When someone searches for your business and finds you on Facebook, Twitter, LinkedIn or Google+, or finds your Google Places page or a listing on a review site, including the Better Business Bureau, will they immediately know it is you? To ensure people always recognize your web properties and to build a recognizable expert brand, be consistent in all you do including using the same design elements such as color, images and logos. When a visitor finds your business, make sure there is no doubt that they have found the right business. You can’t just set it and forget it. You have to be present regularly to respond to questions, participate in conversations and acknowledge those who mention you on social sites. You also need to keep content flowing regularly, updating your blog, offering new content to your visitors and sharing content from others you find interesting. On the local search front, it is also not enough to just let your business listings lay dormant. Seek them out and claim them, ensuring your company name, address, phone numbers and all other relevant information is accurate and consistent. 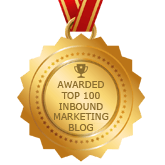 To search engines, Masterful Marketing and Masterful Marketing, LLC are not the same. Creating the right content for your audience is difficult, but if you create a content strategy that defines what you are going to write and a content marketing strategy to define how you will use that great content to gain visibility, you will be more likely to be found when your audience is searching for a solution. Get their attention and help them out of a problem and you become a valuable resource they will keep going back to for advice. You have an opportunity to optimize your web presence, including website, social profiles and business listings using your top keyword phrases. Once again, you can’t just set it and forget it because search engines change how they index web pages frequently, so you need to produce new content and incorporate basic SEO components to stay visible and highly ranked in the search engine results. Periodically do a review of your web presence to be sure all listings are kept up to date. If something changes, update it across all properties. If you get a review on one of the review sites, know about it. You never want to be surprised by a good or bad review. Keep a spreadsheet of all the sites where you have claimed your listing so you can keep them updated when necessary. How does your business look to searchers? Creating a successful web presence takes a commitment in time, effort and persistence, but the payoff is huge. Ensuring that all of your web properties work together to project the consistent image and professional reputation you want is important to getting found regularly. Make this the year that you commit to your online web presence and make it the best that it can be. Have you done a web presence analysis and put together your plan? Web Presence Analysis: How Visible is Your Business? The 6 critical elements really suits for a very good web presence. I guarantee that these will help out one’s website to attract more prospect clients. With it detailed tips, web presence can exactly takes a long time commitment that it has the best it can be. I think brand consistency can also be applied to a personal brand, not just for a business or traditional product. I dabble in many things that can be found in Google results and the only brand I have is my name. If one searches my name, they will find my rewriting/proofreading website, my photography websites, my church planting website, my social media/blogging tips website, and my interviews website. Maybe it’d be beneficial to only focus on one or two of those. But at least the first result that appears on Google is a “Who is Brian Humek? What Does He Believe?” page which includes my various websites. A definite must in personal branding would be to make sure page one on Google for your name doesn’t have your website or sites mixed in with comments you’ve left on other blogs. Those are alright for page 2 or 3 and following, but not on page one. I totally agree and in some ways, your personal brand has to be extremely consistent! If you try to be multiple identities, you will fail. People need to figure out who you are and what you’re passionate about with a little personal interests thrown in to make you a human. I’ve rarely seen comments come up high in the search engine rankings, but if you can find me, in whatever fashion, I’m OK with it. Yes, it would be great if I could order the results the way I want people to see them, but we’re at the mercy of the search engines. Debra, very well put! Search is now more than just Google (YouTube, Facebook and Twitter are among the largest “search engines” for their internal content) and web presence is more than just a corporate website. To maximize the chances of being “found” when a prospective buyer is looking, companies need a broader view and coordinated approach to maximizing their web presence. Tom, I expect a lot of small businesses will be very overwhelmed with what they need to do for gaining visibility in search and will be disappointed in their results if they don’t commit to, as you put it, a broader view and coordinated approach, to their web presence. Debra is truly the master of social networking and internet marketing. From her useful daily advice, to her webinars and marketing packages, Debra can offer something for everyone’s budget. Debra walks the walk. Her newsletter and website reflect her professionalism and knowledge. I would not hesitate to recommend her!